You challenged us, and we delivered the toughest, most capable, and most clever Can-Am ever. It'll excel at everything you demand of it, with a superior feel that's immediately noticeable. The Defender pulls out the stops—and hauls them away. The Defender offers two very capable true-work powerplant options. The work-focused Rotax HD8 V-Twin delivers 50 hp and 50 lb-ft torque for tough tasks. To simply get the job done, meet your new yardstick; the new Defender HD5 single cylinder Rotax engine delivering 38-hp. The Defender is now the sharpest tool in the shed. The Defender is an extremely capable off-road vehicle and a legitimate workhorse that uses a chassis with automotive-like technology and fabrication tolerances that are in line with modern pick-up trucks. The high-strength, low-alloy (HSLA) grade steel means a more rigid design for taking the strain of heavy-duty chores. Can-Am engineers put the Defender frame through the new rigorous Utility Test Cycle at the winter and summer testing grounds to ensure its toughness. The open dash design features a handy removable and water-resistant 1.8 gal (6.9 L) toolbox, an industry exclusive, to allow users to carefully carry tools and supplies their need in an organized manner. In addition, it includes 0.4 gal (1.3 L) of under dash storage with an enclosed pocket, perfect for stowing small essentials. All in all, the Defender proposes a total of up to 3.1 gal. (11.7 L) of storage solutions. 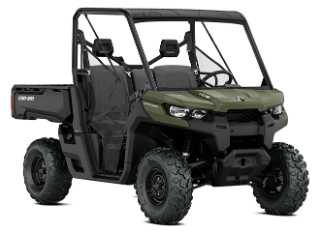 The sturdy Profile cage (steel) is designed in tandem with the Can-Am Cab and genuine accessories to ensure the best fit-and-finish and seamless integration in the industry. To enhance visibility and improve entrance / exit of the cab, the front section of the cage was moved far forward.